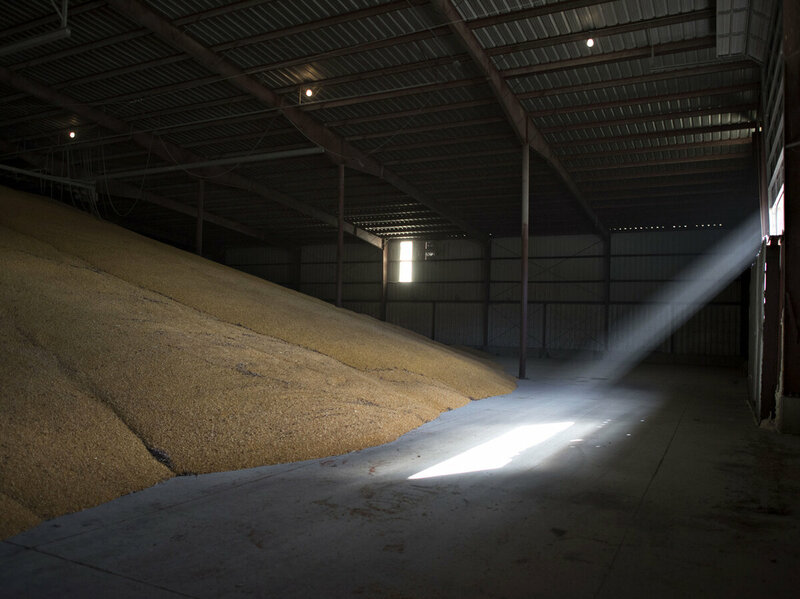 Why Aren’t American Farmers Cheering | "Global Possibilities"
Sunlight streams into a corn storage building at a Michlig Grain storage facility in Sheffield, Illinois, U.S., on Oct. 31, 2014. The price of corn has been falling for months. U.S. farmers are bringing in what’s expected to be a record-breaking harvest for both corn and soybeans. But for many farmers, that may be too much of a good thing. Farmers will haul in 4 billion bushels of soybeans and 14.5 billion bushels of corn, according to USDA estimates. The problem? Demand can’t keep up with that monster harvest. Corn and soybean prices have been falling for months. A bushel of corn is now worth under $4 — about half what it was two years ago. That has farmers like Gene Trausch worried. From the cab of his John Deere combine, Trausch watches the machine churn through a field of soybeans. His irrigated soybean fields are showing big yields. So did the corn he recently picked. “We out-produced ourselves,” says Trausch, who raises raise corn, soybeans and wheat near Minden in central Nebraska. When prices started booming around 2007, farmers planted millions more acres of corn and beans — much of it in places where they would normally grow wheat or cotton. Even land set aside for conservation was plowed up to grow corn. Trausch jokes that Mother Nature usually keeps things in check. That means a glut of corn and soybeans and the lowest prices in at least five years. To make matters worse, the oil boom in North Dakota is tying up the railways used to ship grain. Trains for things like coal or imports are also running behind. Bruce Blanton at the U.S. Department of Agriculture says the wait means some of the harvest could go to waste. “If there’s not enough storage, and the rail service problems persist, grain could be stored on the ground and run the risk of spoiling,” Blanton says. Some farmers will have so much grain to sell, they’ll still manage to make some money. Others will lean on saving or subsidized crop insurance. Low prices could even trigger a new set of government safety nets in the Farm Bill. Cory Walters, an agricultural economist at the University of Nebraska-Lincoln, says rising costs for everything from seeds to fertilizer make these low commodity prices harder to handle. Indeed, in 2013 American farmers reported their largest net incomes in 40 years. But that was last year. And until prices move up again, farmers like Gene Trausch who had cash to burn a couple of years ago are saving, not spending. Farm machinery companies have noticed. John Deere plans to lay off 1,000 workers at plants in Iowa. Another company, AGCO, says it will cut around 100 jobs in Kansas. Trausch says he’ll stick with the same giant, green combine he bought used five years ago. “I looked at replacing it, and they wanted $400,000 for a new one. Well, that don’t work at $3 corn,” he says. While Trausch and some other farmers remain on solid ground financially, others will likely struggle as they try to figure out what crop to plant if commodity prices stay low. But in agriculture, that’s often how the cycle goes.